Oscar Cadenhead scored 67 (Eketahuna) yesterday and 66 ( Masterton) today to win the Recreational Services Masterton Eketahuna Pro-am. 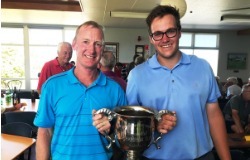 Christchurch based Cadenhead won from a fast finishing Harry Bateman 70, 64 and Kieran Muir 65, 69. Justin Morris the first round leader finished in fourth place with 64, 71. The Lansdowne course was in wonderful condition and the full field enjoyed temperatures clinbing over the 30 degree mark. Cameron Parr from Recreational Services is shown presenting Oscar with the trophy.